I confess right from the start of this blog that math and I are sworn enemies. A very large number of people are enfatic with their support of the fibonacci sequence (the golden ratio), Elliott Wave's, Pivot Points, Murrey Math, and value areas/points of control. Did you know you can use the fibonacci sequence and golden spiral to predict or explain family tree relationships, petals on a flower, or seed heads in nature? Well I didn't, and as I began researching this topic I was amazed when I started reading Fibonacci Numbers in Nature. 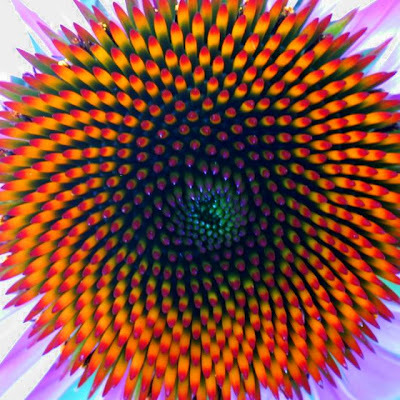 This image of a coneflower has mathematical qualities that can be explained. The shapes and spacing of the seeds, as many things in nature, align with the Fibonacci sequence. Elliott Wave theory says that the market has predictible waves (up or down) and that by counting them, you can predict their weight or significance, such as whether the next wave will be up or down, large or small. There are also A-B-C corrections, and in fact there are many specialized software packages designed specifically to trade these wave patterns (such as MTPredictor). I believe there might be some similiarities between Tom DeMark's approach and the Elliott Wave theory, although I confess to not have dug in and really examined that yet. With Pivot Points, the idea is that you can use past market data/price to predict where major areas of support and resistance will exist in the future. 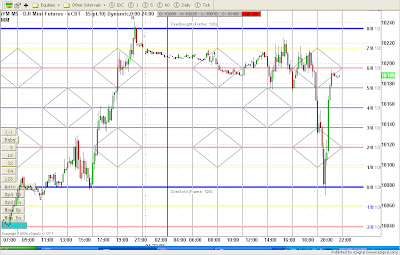 There is the pivot point (High + Close + Low) / 3, and then multiple resistance (R1, R2, R3) and support (S1, S2, S3) areas. You can define these by adding the High's, Low's or Pivots together and doing some math. Once a previous support area fails, it becomes the new resistance, and vice versa. You can find many indicators that will plot pivot points for you, and I've also found that MyPivots is a great resource for the Pivot Points trader. Murrey Math, created by T.H. Murrey, uses geometric shapes and fractals to predict important areas (price) in the market that may act as support or resistance. Murrey describes it by saying, "This is a perfect mathematical fractal trading system". The best resource I can suggest for adapting Murrey Math to your trading is this excellent and extremely popular thread on ForexFactory. In general, I have avoided all of these mathematical analysis techniques like the plague. My primary reason is that some of them throw up so many different "important" numbers on your chart, that you can literally find a reason every 1 point on the ES that you should, or should not, be trading. This is not helpful to me. Yes, after a move I can throw up a Fib Extension or Retracement and see it was a 50% retracement. Or maybe it it was 61.8%. The thing is, on most charts there is such a small difference (in ticks) between the areas that you can find confluence with any number. 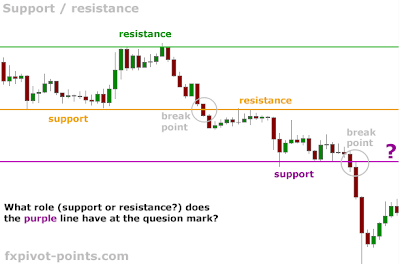 However, there is obviously a beneficial aspect to being able to identify key areas of support and resistance, whether they be based on pivots, fibs, etc. At best, you can trade with extra caution around these areas just like you might with the VAH/VAL/POC (value area high/low, point of control). Lately I have been taking more interest in these numbers and math, particularly the Murrey Math ideas. You can find a Murrey Math indicator for NinjaTrader here. I seem to find this math the one I can relate to, and as such it is the one I am gravitating towards. I also found a very interesting indicator called SwingTemp which counts the number of swing high/lows, and how many ticks was in each move. The indicator can also apply an automatic fib retracement chart at the end of each move, for NinjaTrader. I have yet to find a way to make this useful in my trading, however. I would like to learn more about fibonacci's but am thinking that my toolset is lacking. I have not been able to find a really good NinjaTrader tool that can automatically apply retracements and extensions at the appropriate levels and project them to the future in a way that is useful. So, I'd like to hear from all of you. What tools are you using? What indicators? How are you applying them? How does it impact your trading decisions? Please chime in. Sam - I agree with you, though I'm a fan of pivots too. Your ModHA2 indicator is a good paint bar system, however I've yet to find a good chop indicator. Woodies Sidewinder is reasonable, but have you got a recommendation for a good chop indicator? I fall into the camp that if the mathematical S/R levels are useful, it is because others are aware of these levels and they become self-fulfilling. But which ones and how often? Which Fib retracement or extension level? Which particular calculation of Pivot Levels? Daily levels? Intraday levels? Many will say that these levels are not precise price points, but a range around a price point. When you combine all of the ranges around all of the possible mathematical price points, that pretty well covers the chart. I think that those who find some success with these levels have good trading skills and trade management, accompanied by a belief system that consistently incorporates these levels as useful places to take action. Nice explanations out there about all these legendary dudes. Here's my opinion about EWT and Fibonacci. First of all, they kind of go hand in hand. Second, (me myself have been using strict EWT in my trading). If I am to be giving the short story about all this. I would say that not even they are close to the Wholly Grail. Even though you get that impression when you first find them. But they do something that easese ones trading a lot. They can help you "predict" corrections (chops). And that by itself increases the risk reward probability. Now, in order to get familiar with these techniques requires a lot of time, and you deal with a great risk of seeing everything as that. I mean you gone see waves all over the place. The most important thing in all this is that, there's non out there that can predict the future. In a way it should be possible because we're dealing with patterns repeating them self's. The only problem here are the minds behind the pattern. And by minds I mean all the actors in the market using a mind. And that's pretty darn all of us. And if you go back to your own mind, when you started this journey. You can sure find a lot of irrationally taken actions and decisions. If I would use, EWT I would use it in order to give me an edge over the chop. Like, now for ie. I've struggling like crazy in order to find real good entry signals. And returning to your stuff and all the help I got from them (thank you again). I've been experimenting with all kinds of entry signals. I still can't avoid chop. That leads me to (obligates me) go back to discretionary trading. And because discretionary involves mind. We might as well give EWT and FIB a chance because they're based on structures in nature. And we ourselves posses these structures. But again, in order to get it to function right. Don't use it to predict movements. Use it in order to enhance your probability for good entrance. I would recommend a guy called Robert Miner. He's explaining EWT on a practical level. I got a great deal of material from this guy I could be sharing with you. If there could be a way for us to share it somehow. I really don't feel like putting out my email publicly. No offense traders. I love traders, it's just that there's a risk for other to be bombarding my email box. Til the next time, Take care, and thanks again for this great job your putting out there. The problem I've had with EWT is when to start the wave counts, it seems to be very subjective. However, I have to say I haven't done a lot of intense study of EWT so I'm not expert enough to be professionally critical of it, it's just my hunch. I was using ProfitSource, which I purchased through the Optionetics seminars, which can draw and filter Elliot Wave swing entries for you, as well as prediction tools to where the next wave will go. I had some success with it but also some failures. See some of my usage of it here from a couple of years ago. As for Fib, I mean, 31, 50, 62, just about any move can be traced to around those levels because they touch about 50% of all possible moves. For example, if a move is a 40% retracement some will mark that as near a Fib retracement of 50 or near a Fib retracement of 31%, so just about any move from 25% to 70% can be pegged as a Fib retracement. And, I do believe they are self-fulfilling. Thanks for your help. I'll look into the ECO2New2 indicator. I've had good results with the Ergodic before, and this is pretty similar. Neat use of the DoubleMA(Zerolag) by the way! Can you explain more of your system? What do you use as a entry signal and exit signal? I can see you use a 37/45 Double MA and an ECO2 indicator but I'd like to understand more. Thanks all for the great comments and discussion, keep them coming. For those wishing to contact me directly by email/PM, I can be found on Ninja forums under the name ctrlbrk. Then make sure you set threshold to 0, not 0.1. Very creative use of DoubleMA, I like it. Made up/down color transparent, flat color is the black dash line right? Have you found a way to make SwingTemp enhance your trading? I couldn't. yes you guess it correctly, swing is just to visual the HH, LL of PA and it visually shows you when price tests the black dash line more than one times for s/r. i rebuild my system, thanx to sam and mike for great impression. here are screen, i hope better does not go. What do you mean by "Full Account Force" ? More importantly, what tools are you using with regards to the fib trades / anything beyond the usual drawing tools in Ninja? I ment that when price reaches "Golden level"
I usually go with full margin, for example buy/sell 20 es contracts with 10000 account. Nice, can you post what trades you took and what your setup is? Thank you for the response. Can you give a time/date of an example of what you would call your Golden Level trade? Do you also have a screenshot of what your chart looks like for today or a similar day? How about these entry bars with white arrows? I have not used Heiken Ashi with range bars as it distorts the bar ranges and you get inconsistent bar sizes. Why does it do that and how do you deal with that if you are using HA to trade from? Sam, are you using the concept of the ECO fading dots as chop? As you know, in a decent trend move, these fades are the retracements in the trend and not so much sideways consolidation. I know you have your own HA paint bar setup, and I'm sure you know that if you use the ECOBars, you can paint the fading bars to alert you of 'chop' so you don't have to have your modified ECO chop panel - which is very neatly constructed, btw. Any thoughts on using the RSqueeze as a chop indicator? Consider setting it at 20 and both Keltner and Bollinger at 1.5? Good discussions. I've added a Chat Box to the main page that might make discussions a bit easier. Sam, excellent recovery! It appears you may have a 2:1 risk/reward ratio, but your high winning percentage keeps you well in the green? And were you risking 8 ticks for a scalp of 4 ticks, instead of the 6 tick profit target you often shoot for? Good trading, again. Congrats! I just want to know, how to make the line like that. i just want to understand when to entry and exit in the market, with that line it's easy 4 us. Just Top and Bottom line in the chart that crossing sam..
what is the cal on your sss powerbars ?? wh, would you mind sharing your screen with with us? Hello Mike. Thanks for sharing so much in your blog. I have been looking for the settings you use on your trend bars but have been unable to find it. My trend bars use a custom moving average and have extra code for a hard-fixed stop price, etc, so the settings aren't going to work. Sorry. I would prefer indicators that are based on some statistics, the only one I am familiar with is http://www.elliottician.com/. Interesting, is somebody have something like that in mind? Ok Mike. Perhaps you or someone else more experienced with this indicator can throw me a bone and give me a starting point. I am willing to experiment but have no idea where to start. Good info (FX trading, but most still applies directly to futures). I also will be doing another blog specifically about Murrey Math very soon. I do still use BWT but infrequently. The toolset is ok, but I feel I have outgrown it somewhat. I think most traders will agree that you can make money using basically no indicators at all, so which indicators you choose to surround yourself by is very subjective. You have to find what works for you and go with it. It's not that BWT didn't work, it's more that I feel more comfortable with other indicators. Roonius' TS SuperTrend is quite similar for the price bars/paint bars, when you use a good moving average like Jurik. With standard moving averages it is tougher to replicate BWT's efficiency, I think that is because BWT itself uses Jurik in some calculations. Jurik is not free, you need to purchase them. As to why they are even "half-present" in the default NT configuration, well, clearly NT is getting kick-backs for that.